i’ve only been there once, but i’m head over heels in love with gracias madre. 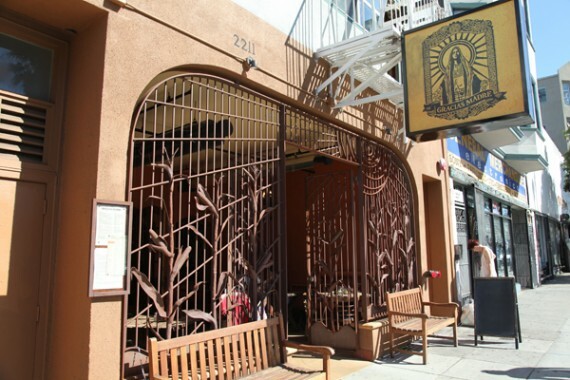 the entirely vegan restaurant in san francisco’s mission district serves up huge portions of organic mexican food that’s just fantastic. we hit up gracias madre a couple months ago, and were shocked by how good it was. we were first taken aback by the amazing atmosphere. i’m used to vegan restaurants being small and often times dingy…but this was a huge wide open space with a clean and colorful decor. it was pretty busy when we were there, so we decided to grab a seat at the bar. we ordered two appetizers, an entree, and a side…so i think we did a pretty good job of getting a fair sampling of the gracias madre menu. next time we will have to get a dessert though, because i hear the flan is awesome. first up, we split the “ensalada de caesar”, gracias madre’s vegan version of a caesar salad. good, god! it was incredible. 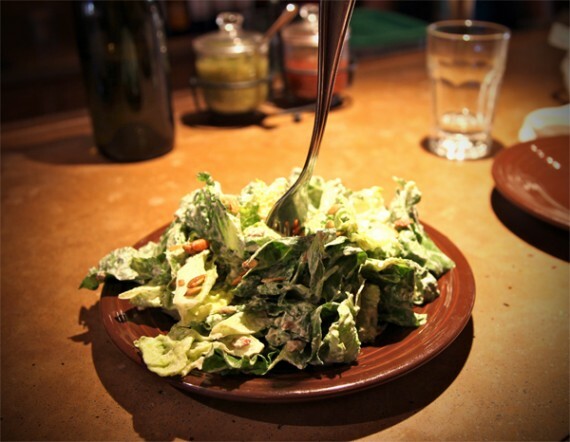 fresh dark greens covered in creamy dressing and sprinkled with toasted pepitas for a spicy kick. 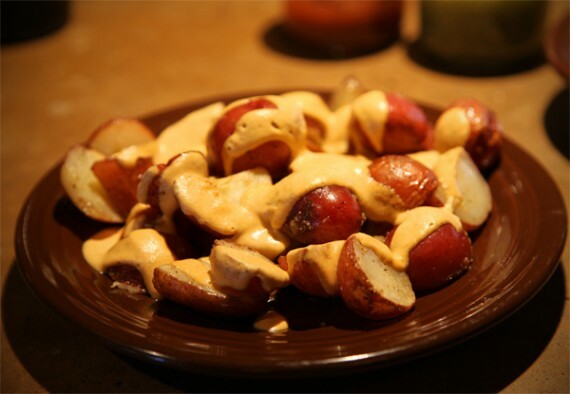 next up, we shared the “papas al horno,” homegrown potatoes roasted in olive oil and smothered in cashew nacho cheese. this was by far the best dish on the table, and i have been fantasizing about it ever since. seriously, this cashew cheese has got to be the best tasting nondairy cheese ever..it was so thick and full of flavor. 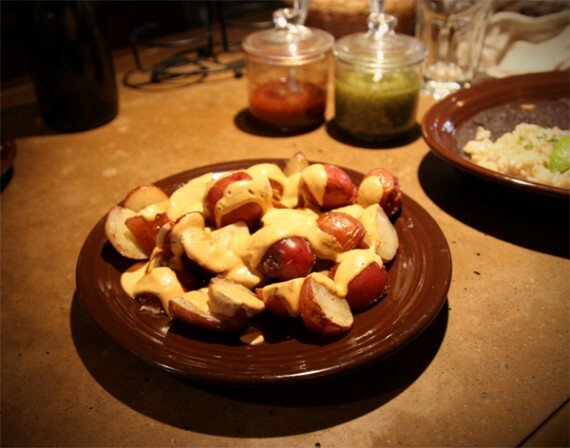 the small round potatoes were cooked perfectly with just the right amount of oil. they tasted so rich and fatty, bust in such a delicious way. 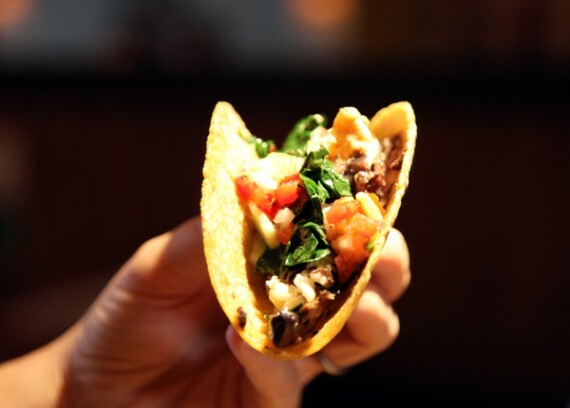 i know i will be ordering these on every visit to gracias madre, no matter what. for our entree, we split the “platillo de legumbres,” a plate served with the choice of 2 side dishes along with rice, beans, and tortillas. 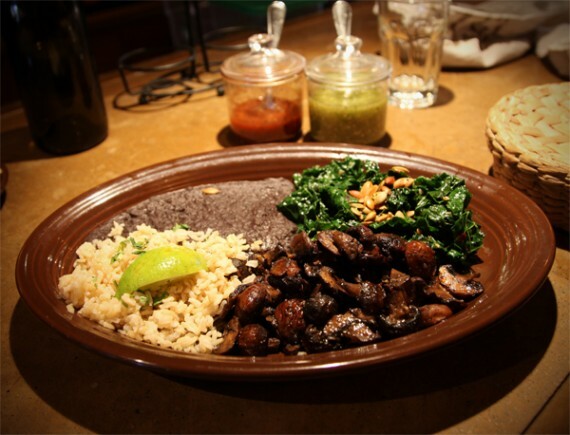 for our sides we got the “hongos” (sautéed mushrooms with garlic) and greens (seasonal greens with garlic and chiles). both sides were excellent, and so were the rice and beans. the beans especially stood out because they tasted like old school mexican restaurant beans that are usually loaded with lard and other unmentionables. seriously authentic-tasting good stuff. 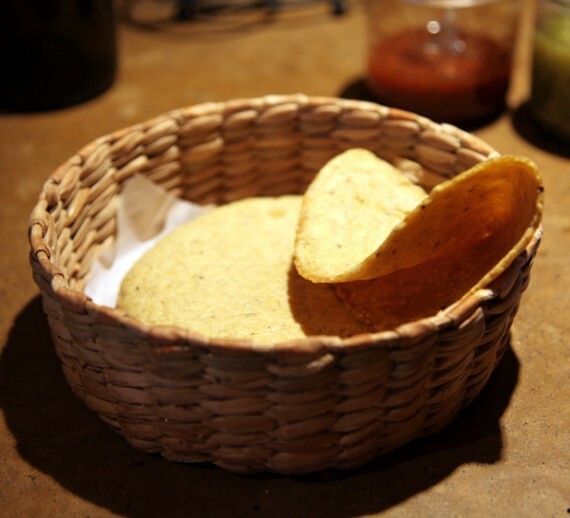 the basket of corn tortillas was huge, and they were fantastic as well. warm, soft, and homemade. 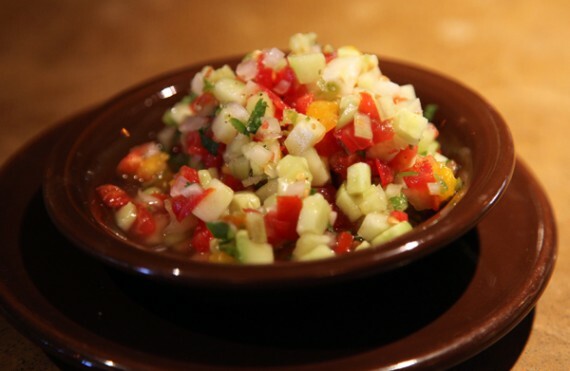 we ordered a side of pico de gallo as well, because we thought it would go great in the tacos…and we were right! so colorful and fresh, and such a huge portion. it made for the perfect topping. 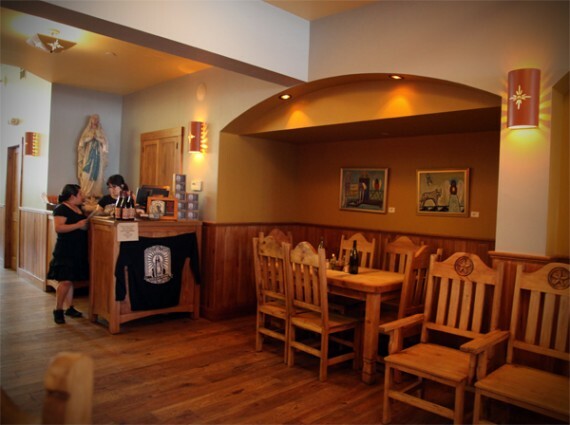 gracias madre doesn’t stop at food though…they also serve eel river organic beer ON TAP as well as a selection of bottled brews, soju, and a full organic wine list. we had been boozing at monk’s kettle before eating, so we skipped the alcohol. i know i will be enjoying a draught beer with my mexican grub next time, though. as we sat at the bar for ages and got completely stuffed on incredible food, a mariachi player took the floor and started circling the restaurant. how cool is that?! 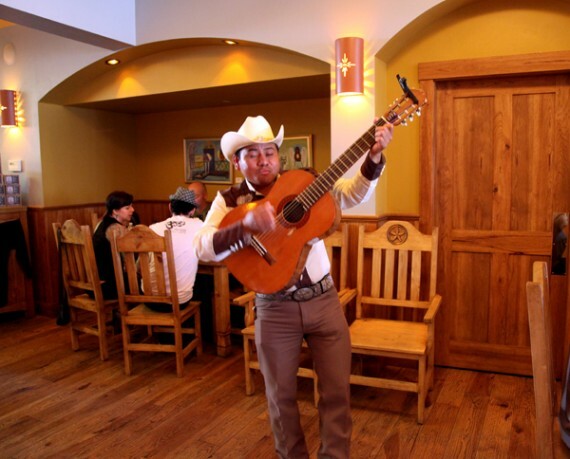 eating at gracias madre is seriously like eating at a nice, “normal” restaurant. 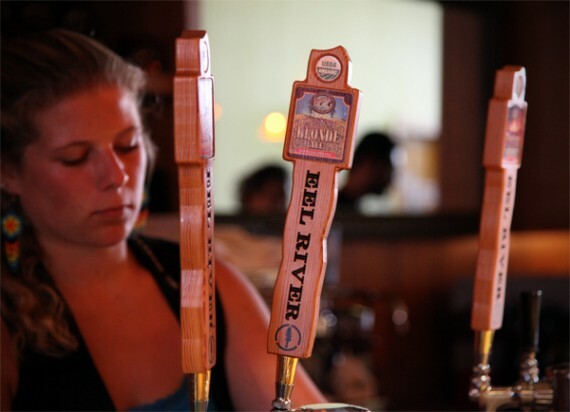 lots of booze, entertainment, and a very comfortable space…it doesn’t feel like your typical vegan joint. plus, the food is downright phenomenal. i am counting the days until i get to eat there again. what a great review and pictures, thanks, QG… I’ll be sure to check it out. WANT! Simple but looks very tasty! I would be the happiest girl in the world if Gracias Madre would open an NYC location. It would be huge! Wow, those tortillas alone are worth the flight to San Francisco. I love it there so freakin’ much. Except the food is so good and filling, I can never eat enough of it. Haha. I tried going here on my last trip to SF but the wait was an hour long. But I am dying to try it! Hands down my favorite spot for dinner in SF. Their quesadilla is life changing as are their garlic mushrooms!!! Started by the owners of Cafe Gratitude. Speaking of which, when will Cafe Gratitude open? While I’m at it, whatever happened to Plum Bistro Seattle’s expansion to Los Feliz? And what’s the news on Dave Andersen’s “hollywood area” restaurant? Answer me. I’m hungry. You NEED to try their quesadillas. I have to say I wasn’t overly impressed by the Platillo de Lugumbres or the Empanada BUT the quesadilla may have been the best thing I’ve EVER eaten. So delicious (spicy butternut squash filling). I hope one opens in Los Angeles soon, that looks marvelous!! Gracias Madre rocks. The first time we went there, we waited 2 hours for a table. It was well worth it for the tortillas and mole enchiladas alone. Mmmm, I am about 2.5 weeks away from my next trip to SF and Gracias Madre!